For sportsmen and women, having correctly fitting footwear can make the difference between winning or not; for enhancing comfort, maximising performance and minimising potential injury or pain. Now your feet can be analysed, and by using a special temperature sensitive Liquid Crystal Foot Pad, a podiatrist can quickly see how your foot rests and assess if you need to compensate for high or low arches, by having individually made insoles created. Everyone’s feet are different and high-performance athletes, runners, cyclists, footballers, skiers, and skaters now have custom made shoes and insoles made specifically to fit their feet. But it isn’t only top sports people who are having fitted sports shoes made. Several well-known retail brands such as Specialized have commissioned Liquid Crystal Foot Pads for their stores and shops, to help everyone achieve a better fitting sports shoe. Even those with flat feet, diabetic foot ulcers, bursitis, plantar fasciitis or unusual gaits can benefit, by having the right arch supports, liners and foot cushions prescribed for them. 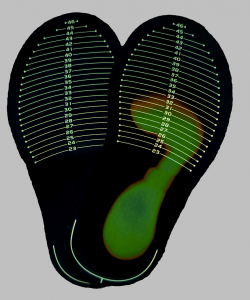 The special Liquid Crystal Foot Pad maps the shape of your foot using Thermochromic technology. 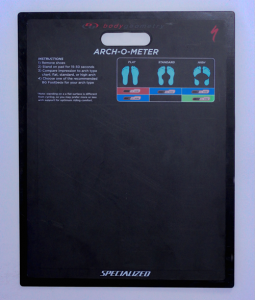 The shape can be measured or even photo recorded, and used to select the correct shoe shape, insoles, arch supports or liners.